Saturday Sampler December 3rd offers ten songs that will heat up the wintry nights up north while adding extra sizzle to the temperatures in the south. There’s a bit of everything, so get ready to move, shake, and shimmer. It’s the weekend and you might need a pick-me-up. Something that will get the blood flowing, the heart racing, and the mind sparking with ideas. You could grab some caffeine, or you could find the sonic equivalent of a triple espresso with Dead Naked Hippies‘ new single, “Lights Out”. As the title suggests, this song is off the charts. The track brims with an edgy, anthemic darkness akin to Savages’ great work. 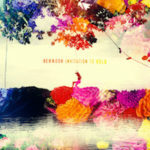 The guitar work is fiery, the percussion is fierce, and the vocals channel the powerful urgency of Camille Berthomier. If this song won’t wake you up, nothing will. 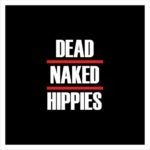 This is Dead Naked Hippies’ debut single. Unfortunately, we do not have the names of the band members. We wish we did because they have made a lasting impression. For a good six years, Dutch Uncles have been on the verge of a massive breakout. Their fourth album, O Shudder, saw them make their biggest jump and, in the process, headlining their own tour. Now it is time for the rest of the world to discover why the alt-pop quartet from little Marple, England have been much celebrated. 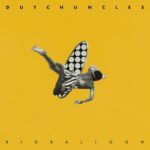 Akin to Grizzly Bear and Wild Beasts, Dutch Uncles don’t follow the standard four-four music playbook. Instead, their music is oft-kilter yet unexpectedly infectious. As proof, take a listen to their new single, “Big Balloon”. The song is bold. It is anthemic. It is glorious. Throughout its 3 minutes and 15 seconds, you cannot help but dance and bop along to the upbeat tempo. Meanwhile, frontman Duncan Wallis’ vocals take us on a whirlwind of a trip, putting us high in the sky and observing our own lives evolve before us. Wonderful, just an incredible experience is “Big Balloon”. “Big Balloon” is the title track from their forthcoming, fifth album. It arrives February 17th, 2017 via Memphis Industries. Pre-order the LP here. Dutch Uncles are Duncan Wallis, Andy Proudfoot, Robin Richards, and Peter Broadhead. It’s hard not to love a band that cites dozens of our favourite bands as influences. Emerging indie rockers New Luna combine the best of Radiohead, Mogwai, The Twilight Sad, Interpol, and Jeff Buckley to create a lush, rewarding sound that sneaks up on you. Literally, an unsuspecting listener may be caught off-guard by the fierceness of their sonic output. These four Manchester lads kick off “Noise” at an unassuming volume. But those warm vocals and dense layers of guitar soon explode into an incredibly jaw-dropping chorus that just might leave you speechless. It’s an impressive start for these talents whose debut album drops December 6. This single is available now as a free download at their Bandcamp page. 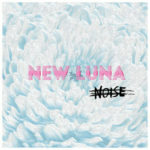 New Luna are: Tommy Deedigan, Zack Bamber, Toby Duncan, and Luke Moloney. The lead track from Belgian shoegaze band newmoon is a beautiful, haunting experience. While the title “Helium” may have a connotation of something light and airy, this single has plenty of substance and depth. It features soaring melodies paired with a moody ambience with mesmerizing effect. You may hear echoes of Doves and Editors as well as My Bloody Valentine as newmoon occupies that realm of darker, brooding shoegaze rock. But this band isn’t merely copying their influences. What they’re doing here is forging their own distinctive path through established territory. “Helium” is a delirious treat from their new album, Space. It’s out now on Mayfly Records (US) and PIAS Belgium. You can grab a copy from the band’s online store. The band’s website has details about their current tour dates. Sunny retro pop never goes out of style. That’s evident when you listen to “Flood Lamp Eyes” from Arizona band The Resonars. Their recent LP (The Greatest Songs of The Resonars) features this timeless tune that is sure to put a huge smile on your face. Founding member Matt Rendon creates music straight out of the ‘60s, so we’ll forgive you for thinking this is classic psychedelic surf rock. The authenticity of their sound makes it hard to believe this is a modern band. They’ve been around since 1997 and have numerous albums in their catalog. But for those of you who are only now discovering the vintage vibes they’re creating, this newly released LP is a perfect introduction point. 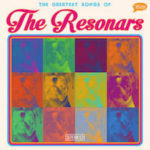 The Greatest Songs of The Resonars is out now on vinyl from Trouble in Mind Records. The LP is compilation of the band’s past eforts plus some new tunes. Grab your copy from their Bandcamp page. The Resonars are: Matt Rendon (guitar, vocals), Cherish Rendon (guitar, vocals), Jeremy Schliewe (bass, vocals), and Johnnie Rinehart (drums). Every five years or so, a young woman bursts on the scene with a soulful style that makes you take notice. Amy Winehouse grabbed the entire industry’s attention in 2005, subsequently winning five Grammys in 2006, including Record and Song of the Year. Janelle Monáe exploded in 2010 with her dazzling blend of old-school soul, R&B, jazz, and pop. Could Ripsy May be the second half of this decade’s genre-bending artist? Her latest single “Dare” suggests that the answer is an emphatic yes. The song is a blend of rock, pop, funk, soul, and R&B, which combine to create a groovy, trippy, and anthemic number. It is May’s smokey and sultry vocals, however, which are intoxicating, engrossing us with a story of a cheating heart. This track is sensual, offering the perfect antidote to those chilly nights. To think, this is only May’s third single overall. A star is born. Fans of jangly indie dream pop have a new reason to celebrate. Canadian indie band The Seams bring plenty of retro influences to their new self-titled single. 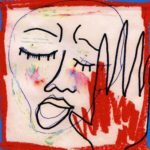 “The Seams” is brimming with sunny hooks reminiscent of Big Star or pre-Orange R.E.M., but leaning more toward indie pop than Americana. A few repeated listens may find you drawing comparisons to late-‘60s/early-‘70s bands like The Fortunes. (“Here Comes That Sunny Day Feeling Again” could be a distant relative of this future classic.) 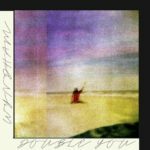 It’s easy to categorize this group as indie dream pop, but they’ve got much more depth than that genre usually implies. With this single, their talent is on full display. 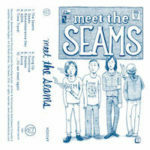 Their debut album, Meet The Seams, is out now on Hand Drawn Dracula and available via the label’s Bandcamp page. The Seams are: Kyle Connolly (WISH, Fake Palms), Jonathan Rogers (Elsa), Jesse Mirsky (Elsa), and Simone TB (U.S. Girls). Some songs instantly give you warm, fuzzy feelings. It’s as if you’ve been reunited with an old friend you haven’t seen in awhile. You exchange hugs, then catch up over beers or coffee. 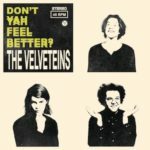 That cozy warmth is what you get with “Don’t Yah Feel Better?” from Canadian indie pop trio The Velveteins. This single is available on iTunes via Fierce Panda. The Velveteins are: Spencer Morphy, Addison Hiller, and Dean Kheroufi. While we have shared a fair number of anthemic songs, we also need moments to catch our breath. Moments to find serenity in our own minds and lose ourselves within the deep thoughts that lurk behind the shadows. 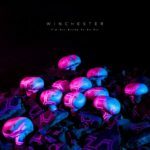 To help us in our journey, Toronto duo Winchester offer a song for us to completely let go. “I’m Not Ready To Go Yet” is incredibly beautiful. It is part cinematic, part cosmic, part operatic, and completely dazzling. The production work is sublime, radiating of the spatial pacing of Anthony Gonzalez’s (M83) work on Oblivion. The song, however, reaches sonic heights that Gonzalez wasn’t able to achieve thanks to Lauren Austin’s vocals, which are stirring and intoxicating a la Kate Bush. Montgomery de Luna’s guitar work is also superb, particularly during the song’s zenith and outro. Bring these incredible elements together and you get a song that is spectacular. Simply spectacular. We love stories of artists who move from the back of the stage to take their rightful place in the center. Natalie Prass, Steve Gunn, and Springtime Carnivore (Greta Morgan) are just three names. Add Wyndham Garnett – a.k.a. Wyndham – to the list because he has a voice and sound you will not want to forget. Garnett started off as a trombone player as a child before adding piano, keys, guitar, and harmonium. He’s played in the touring band for Clap Your Hands Say Yeah, and he was a member of Elvis Perkins’ band and of Brooklyn based Diamond Doves. Garnett’s résumé is extensive, but it is far from complete. Now he adds solo artists to his name, and his debut single is “Shot Up”. The song is fascinating. Garnett’s vocals have the breezy quality of City and Colour’s Dallas Green. His sound, however, is raucous, psychedelic folk-rock in the mold of Morgan Delt and Woods. The collision of the multiple instruments – the bombastic keys, the pulsating bass, the crushing drums, the searing guitars, and Garnett’s voice – is a sight to behold. But it doesn’t stop here, as Garnett displays the skills of a classical composer. The song doesn’t have a single climax – it has three of them. As such, during this four-minute song, you reach euphoria on multiple occasions. Fascinating? This song is awesome. “Shot Up” is from Wyndham’s forthcoming, debut EP, Double You, which drops December 16th.